The Longwood Players begins its 2015-2016 season with Bruce Norris' hilarious comedy Clybourne Park. 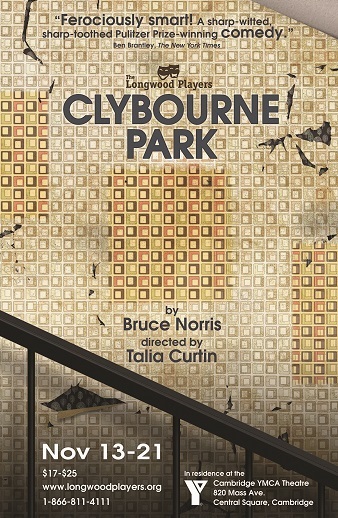 Clybourne Park explodes in two outrageous acts set fifty years apart. Act One takes place in 1959, as nervous community leaders anxiously try to stop the sale of a home to a black family. Act Two is set in the same house in the present day, as the now predominantly African-American neighborhood battles to hold its ground in the face of gentrification. Winner of the 2011 Pulitzer Prize and the 2012 Tony Award. "Vital, sharp-witted and ferociously smart." —NY Times. "A theatrical treasure…Indisputably, uproariously funny." —Entertainment Weekly. "A savagely funny and insightful time bomb." —Hollywood Reporter. "Funny as hell…The theater shakes with gales of laughter." —NY Post.